The cucumber is originally from the tropics where it's always warm and humid weather, so abundant fruiting occurs only with proper care and favorable weather. 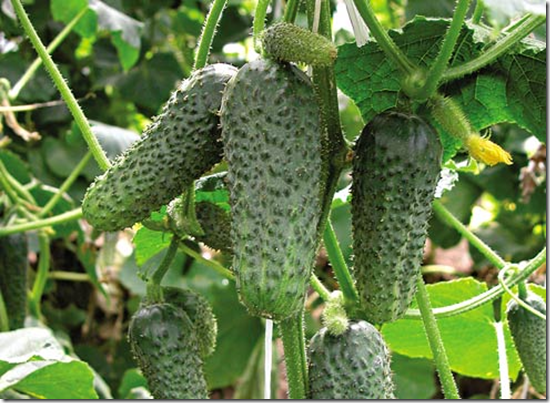 The most demanding cucumber to water, but in different growing periods, watering is done in different ways. Immediately after sowing seeds, keep the soil constantly moist. Watering flower bed from watering can defend, warm water with a temperature below 20 degrees. After germination and from sowing to germination is not more than 4-5 days, continue to keep the bed moist, avoiding drying, but overly abundant watering can lead to disease and all the shoots may die. As soon as the cucumbers will be the first ovary, need daily watering at the root. If the weather is very hot and the air temperature exceeded 25 degrees, spend a daily sprinkling. This will help to cool the leaves, resulting flowers and ovaries will not fall off. If the temperature is below 25 degrees the sprinkling carried out is not necessary, as this may lead to the development of fungal diseases that will adversely affect the crop. The best time for watering is early morning when the sun hasn't risen yet or the evening after sunset. In hot weather need watering morning and evening, and sprinkling. Under sprinkler irrigation under the scorching sun the leaves of cucumbers will get burnt, will turn yellow and wither. When watering the roots, use a watering can with a sprayer. Watering from a bucket or hose may expose roots, which also negatively affect the abundance and quality of the crop. If you accidentally when watering still bared roots, then immediately swipe their soil or backfill fertile soil until the cotyledon leaves. During the fruiting watering produce in the morning and evening is very plentiful. From the abundance of watering depends on the upload speed of the harvest, and all of the ovary will have time to otplodonosivshih before the leaves begin to turn yellow and wither. If you grow cucumbers in the greenhouse, watering spend in exactly the same way, but not without sprinkling, as the temperature in the greenhouse you can regulate with the help of frames.